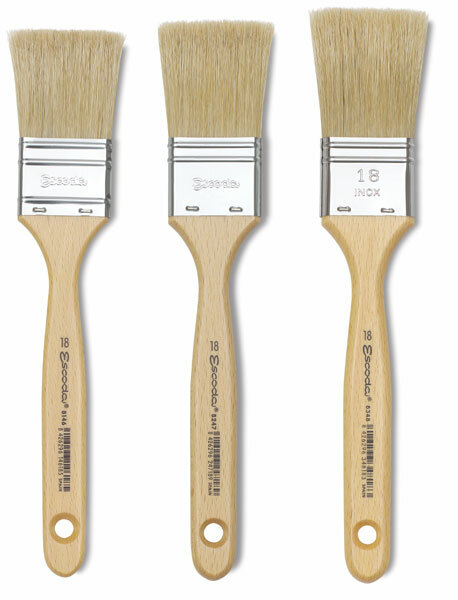 This expertly crafted brush is perfect for covering large areas. If it's natural bristle you want, it's the finest available for varnishing, gessoing, glazing, and similar applications. Each brush is loaded with top-quality natural Shanghai Chungking hog bristle. The bristle is expertly shaped by hand, then glued and triple crimped with a nickeled ferrule. 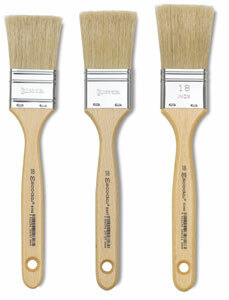 Matt-varnished handles range from 135 mm in length for Size 9 brushes up to 185 mm for Size 48. Each handle has a drilled hole so that the brush can hang when not in use. Series 8247 — Double thickness Chungking bristle ranges from 5.5 mm thick in Size 9 up to 10 mm thick in the Size 30 brush. Series 8146 — Single thickness Chungking bristle ranges from 4.5 mm thick in Size 9 up to 8 mm thick in the Size 30 brush. Series 8348 — Triple thickness Chungking bristle ranges from 11 mm thick in Size 12 up to 15 mm thick in Size 30 and 19 mm thick in Size 48.